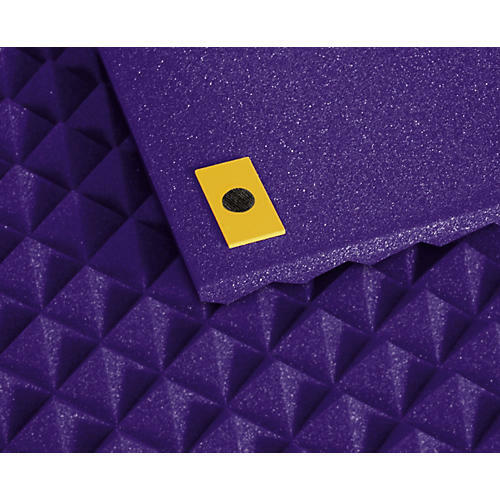 Auralex Temp-Tabs are a temporary Studiofoam mounting solution designed for easy installation and maximum flexibility. You no longer need to commit to permanently placing your acoustic treatments or cleaning adhesive residue and chunks of your investment off your walls. All you need to do is use the included EZ-Stick Pro Tab adhesive to glue the Velcoins to the wall. This is the only permanent contact to your wall. Make sure you space the Velcoins to coincide with the width of the studio foam. Next, the Temp¢Tabs are glued to the corners of the studio foam. All you have to do is line up the Temp¢Tabs at the corners of the Studiofoam to the Velcoins and press. With this system, you can change the patterns of your Studiofoam. When the time comes to move to a new studio, you can take the Studiofoam with you. To treat your new studio, all you have to buy are more Velcoins. It's that easy!